However, the Vikes looked pretty darn good. I’m a homer but it certainly felt like the Vikings outplayed the Saints – only they kept turning the ball over which was ultimately the deciding factor. In fact, they turned it over 5 times! And the Saints gameplan was obviously to take Favre out (which they almost did) which was legal but felt dirty. The Saints racked up 3 unsportsmanlike penalties and a few others that looked like they should have been called. Since that time, we've learned that in addition to the three unsportsmanlike penalties that were called, the NFL admits to making a mistake by not calling another on a hit that injured Brett Favre. Last week Favre posted on his personal website that he had a surgical procedure to repair damage to his ankle that was caused in that hit. The Vikings have a rematch against the Saints in Week 1 and apparently Sharper, if not the rest of the Saints, have decided to that injuring Favre is again the game plan. Keep it classy, Darren. I'm sure people will say its a joke since Darren himself was a teammate of Favre's for years in Green Bay, and that certainly may be the case. Whether its a joke or not, the fact that less than two seasons ago Sharper was a Viking makes this some powerful material for the bulletin boards around Winter Park this summer. 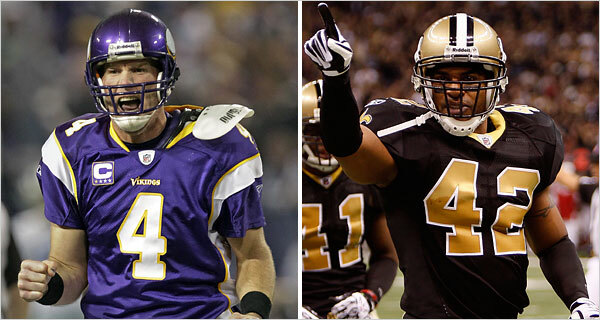 Last night the Minnesota Vikings lost the NFC championship in overtime to the New Orleans Saints. Thus end what has been a more enjoyable season that many of us Vikes fans could have imagined back in August. The loss is certainly disappointing and it personally ranks in between the 1998 NFC championship (played in January 1999) loss and the 2000 NFC championship loss. The 1998 loss will live in infamy amongst fans, as the 15-1 team that both set scoring records and was flawless from the kicking perspective all season long(1) until a missed 38 yarder left the Vikings on the low side of the 30-27 final score. It was so bad that it made it's way into a subplot on the CBS Show "How I Met Your Mother" in 2008 (see image below). The 2000 game was a debacle with a less talented Vikings team losing 41-0 on the road at the New York Giants, which was embarrassing but not gut wrenching like the 1998 and 2009 losses. The big story line for the Vikes this year was obviously Brett Favre, the hero of the rival Packers who upset them last year when he tried to become a Viking but instead wound up a Jet and infuriated them this year when he did become a Viking (and was damn good at it, perhaps having his best season ever). As a fan, I wasn’t sold on Favre at first. I had trouble getting excited to root for a guy that I always hated as a Packer(2) and Favre was one guy in particular that I disliked for the attention that he received from the commentators and media. Having no other choice (he is our quarterback, after all) I finally bought in the San Francisco game in Week 3 where, for the first time as a Viking, he lead one of his famous come-from-behind 2 minute drives ending with a touchdown to a receiver that no one even knew was on the roster(3). As I mentioned before, the overtime 31-28 loss to the Saints last night was gut-wrenching. The Saints had been the number one team in the NFC all season long and the sports prognosticators that I listen to(4) gave the Vikings no chance. The venue, the Louisiana Superdome, was supposedly the toughest place to play and the Vikes had not looked good on the road in hostile atmospheres outside of Green Bay, Wisconsin. Many people will blame Favre for this loss, who had two interceptions including one with 15 seconds to play while the Vikes were in position for a long (very long) field goal to win the game. Personally, I have trouble with that thinking, I’m more frustrated with Pro-Bowl running back Adrian Peterson who has fumbled all year long and did so when the Vikes were in a position to score just before half. I’m not exactly sure why I don’t blame Favre for last night’s loss. It could be that after this weekend I’m emotionally numb on the sports front(5 ) or more likely it’s the fact that the gritty, old man known for his Wrangler jeans and inability to make a decision has actually won me over. I knew that for all the good that came with Favre, so came the bad and that terribly inopportune pick was just part of the bad and we need to game plan around it (we did not) or to put it another way: live by the Favre, die by the Favre. (1)Vikes kicker Gary Anderson converted all 35 of his field goal attempts and all 59 of his extra point attempts becoming the first kicker in NFL history with a 100% conversion rate in a season. (2) And vice versa, when Vikings that I love, such as Randy Moss, go to other teams I still want them to do well – even when I hate their team, like I do the Patriots. (3) Greg Lewis, a free agent signed a few weeks earlier and was active in his first game. (4)Bill Simmons, ESPN’s Sports Guy & his ilk (5)I sat through Cyclones loss to Kansas on Saturday which ended with that stupid Rock-Chalk chant reverberating inside our gym. Just saw this Sportscenter ad the other day and found it amusing - if Ragnar could've found a way to keep the ball in Adrian's hands and we'd be in the playoffs.